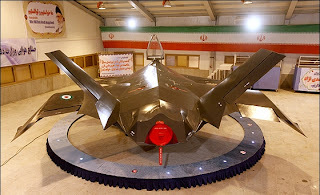 Iranian reveals on 2 February what it claims is a new stealth fighter jet called the Qaher 313. 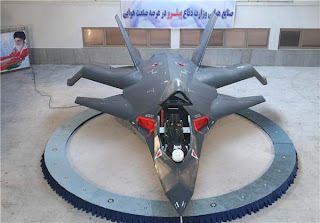 The advanced aircraft with an advanced appearance has a very small radar cross section (RCS) and is capable of operating and flying in low-altitude," Iranian defence minister Brigadier General Ahmad Vahidi tells the official FARS state news agency. 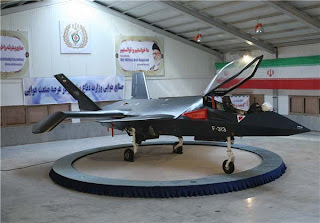 Vahidi claims that the aircraft was constructed using "high tech" materials and incorporates advanced electronic systems. Qaher 313 can be armed with indigenously designed weapons, Vahidi says. He also claims that the aircraft is capable of taking off and landing on short runways. The aircraft was designed and built by Iran's Aviation Industries Organization (AIO), which is part of that nation's defence ministry. The designers claim that the new jet is an entirely homegrown project. Iranian state television also aired video footage that is purported show the Qaher 313 flying. 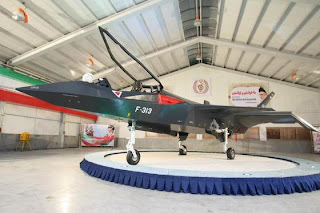 Given the apparent small size of the aircraft and its single engine design, the Qaher 313 could be powered by reverse engineered variants of the General Electric J-85 turbojet that Iran is known to have in its possession.